The morning of the day of the wolf adventure above, we’d gone up one ridge before day light (Fun.) I couldn’t so the last climb to the very top, about 60 yards of what at that time I deemed “death slope”. This area is a little U shaped valley along a ridge, sitting between prongs, or points off the ridge. Ridge and river sit paralell, prongs point at the river, so open top of the U faces the river. It’s about 0.4 miles from river to the bottom center of the U, 0.35 miles from one point to the other across the U. Not a big area. From river to about .25 miles in, it used to be boreal tundra spruce… 90% no bigger than 8″ in diameter. Several years ago it burned. So it’s now a mess of 3″ Dia 8′ tall new birch, alder, and willow, with its floor covered in down, dead spruce… High stepping nightmare to hike in. But it’s dry and flat. At that .25 mile mark is a line, and small grove of larger older spruce forest. It goes maybe 50 yards in depth. Behind it, the rest of the flat into the bottom of the ridge, of the U is moss covered tundra. Moss a good 1.5′ to 4′ deep in places, wet, spongy. And permafrost grown spruce, all about head height and 2″ in dia.. Thankfully that area isn’t muskeg tussoks, but the moss isn’t any picnic to hike in. From the right hand watch spot, on the first ridge point we climbed, from about half way up, looking across the U at an angle, to the next point, and the base of the 2nd point. That first day, they’d gone up the first ridge mid afternoon, to scout. Didn’t see any moose. That evening at dusk they went up again, and I hunted watching a sand bar along the river, couple hundred yards from camp. I didn’t see anything but a Huge beaver. All they saw was two other hunters on the next point, that hiked in from the river! That next morning, (wolf day), we all went up before daylight, and watched. That pic there ^^ is from my vantage point later in the morning. They were a bit higher than me furthet up on my right. We would have gone over and up the second point at that time, but figured the other two guys would be back that morning. They never showed. Around 9 am, they saw a moose, good sized one, a loooonnnnggg ways out on the burn flat past the second point, about 700 yards, headed our way. I never saw him that day. You have to know what your looking for at that range, it’s amazing the one guy saw it to begin with, but he has eagle eyes for that stuff… saw it at first with bare eyes, No Glass!! Anyway, about 10, they decended into the U and crossed the valley behind the trees, in the mossy mess, to the other point, and climbed it. 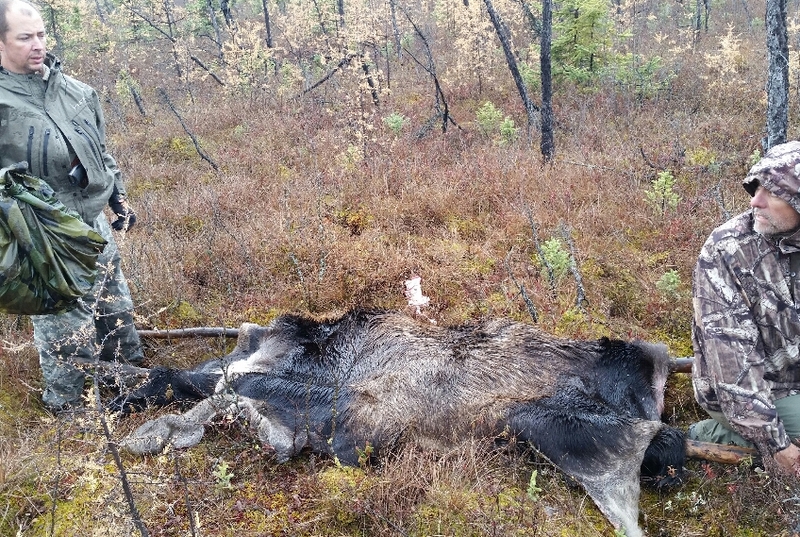 By 11, the moose had bedded down, off that point a few hundred yards out. I headed back to camp (mid way between points, on the river). They went off the other side of that second point and into the valley there, and scouted around, back to camp, around 1 pm. If we’d known that morning that the other two guys weren’t coming back, we’d have gone up that second ridge then, and could have shot that bull that morning, he came well within range before bedding. As it was, he bedded before we got anyone on that ridge. 3 hour watch, around 730pm was when he shot the wolf, and I went down to help. The big bull never showed again that evening. Around 8 after we got back to camp with the wolf, our 3rd guy that had stayed up top(Ole eagle eyes) saw another pair of bulls headed in along the same line the other had taken into the area, these two a good 900 yards out. Younger smaller bulls, spike forks both of them, a medium sized one and a smaller one trailing him by a ways. Too far out, too late to worry about, but maybe the next day they’d range in better. Late dinner that night after he came down around 9, then we were up till 12am,while he skinned out that wolf. In the dark, in the cold, in the rain (sleet, almost snow actually ). Next morning about 530, up and breakfast, and they headed back up the steep 2nd point. Wanted to be there when that first big bull started moving around. I’d had too much mountain goating around, and general hiking the first couple days, was starting to blow out a muscle in my right thigh… Figured if I was going to be of any use helping to butcher, and pack out meat if we got one, I needed to stick to the flat land and stop trying to climb ridges. I stayed in camp till around 8, then went and tried to hike to the sand bar I’d been watching, long the river. That was Fun. Had to head into a stand of old growth spruce along the river, some 4′ in diameter at the base. And more dead falls. But unlike in the burn area, these were 10″ in Dia and bigger. And the area had a drainage ditch/street bed. 915am, 3 shots off the ridge above me. Headed for camp a little faster. They were up there watching, nothing moving in the flat, when suddenly he saw movement out of the brush at the base of the ridge below them… That big bull had skirted the base of the slope, too close to the ridge to be seen till he got out 100 yards or so! Walked right by under them. He also went right by the spot I’d sat the evening before, within about 50 to 70 yards!! If I’d have been up there he would have crossed below me, in perfect range, at a slow walk, broadside! As it was, he heard my friends, gave a lot at them up the ridge, and broke into a trot toward the center U trees.. They fired two shots that missed him as he turned, and then God blessed my buddy on the 3rd shot, as the bull got to about 350 yards out, into the mossy area, he shot for the spine downhill, bull facing almost square away from him. Missed the spine, but the shot went into the rib cage. Little later dressing him out, the shot broke 3 ribs going in on the left side, made hamburger of its liver, through that lung, destroyed the aorta, and passed into the off side shoulder or brisked. Hydrostatic show made jelly of the other lung, and blood shot some brisket, neck. The bull took a few steps, about 20′ if that, and dropped in his tracks. When oppenened up, the body cavity was Full of blood, and there was no blood in the meat as we butchered it.. The shot destroyed the aorta, but missed the heart, and under a run, and adrenaline, the bull heart kept going and pumped himself dry, bled out Fast, and dropped. The only problem was, the side of that tree line that he ran to. Lol. So packing him out was 50 or 60 yards of mossy muck, 50 yards of (active use! )bear trail through the timber, and 200, 250 yards of the burn area. FUN. The most entertaining was getting the head and hide out. Skinning went so fast with three guys, them two cutting and my pulling the hide, that he decided he wanted it in one piece, to keep. The fact that it’s a chocolate brown and deep black, I can’t blame him, it’s gorgeous! And the 4×5 52″ rack, he wanted for a full European mount (antlers on skull). So, hide folded around two 10′ poles laid shoulder width apart, poles on shoulders, and carry it out. Oi. I did about a 40 yard stretch of that in the burn area. As the guy in back. Learned how easy it really is to hike in that otherwise; you can see your footing. As the rail gut carrying the hide, you see hide, not the ground. Oi! Took us all that first day to butcher it all, bone out the quarters, and skin it, and pack out about 1/4 of it. Took all day the next day to pack out the rest of the meat, the head, and hide. Going into this I was worried that my back and hips wouldn’t take the packing. They said that’s fine, it’s a group effort for all of it, I wouldn’t have to pack meat if I couldn’t/didn’t want to. I figured I was gonna feel real guilty doing that and planned to do as much as I could, as safe as I could. After the amount of work I put in skinning and butchering, and only actually cutting for 5 minutes, I understood. It really is a group effort, and takes a lot of work for an animal this size. I wouldn’t have felt guilty not packing meat. But I did. Some of that was entertaining, we only had one pack frame. So you grab a meat bag, 30 to 40 lbs of meat, sling it over one shoulder, and hike. Ugh. I did one trip with the pack frame, 55 or 65 pounds of meat.. That was easier since it balanced in one place on your back, and you had your hands free in the brush… But damn that was heavy. This next pic is pretty graphic, but I’m proud of it, so I’m posting it. Shows what the carcass you leave Should look like… ALL meat harvested. Law requires all usable meat be taken, but a lot of guys leave a great deal… We did the legal, and ethical thing and stripped everything. 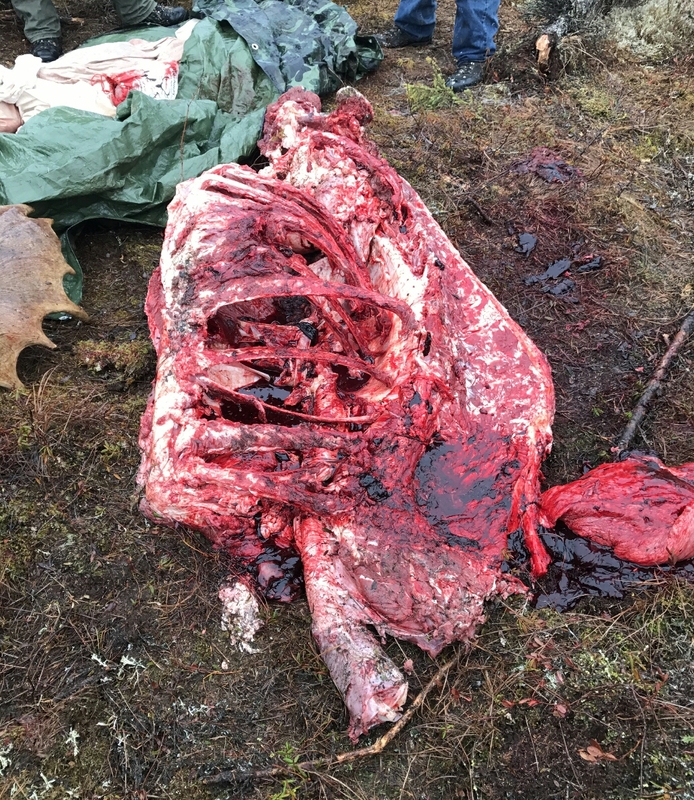 All we left was a gut pile, a pile of feet, and that carcass. Anyway, great experience, wonderful time with a good friend, and a new friend (one of these guys I’d never met till the morning we headed out!) Wouldn’t trade any of it for the world! We pulled a little over 600 lbs of meat total off the animal. After what I’m giving away to friends, and folks I know that had a bad year, that need it more than we do, I’ll end with more than enough for us, will easily last us till next season, at more than two moose meals a week. At this point, I know of 7 families that will be eating from this harvest, and I’m sure the other two guys are giving more away.. GOD IS GOOD!! !